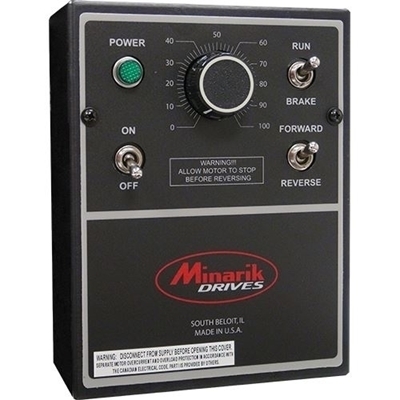 Minarik Drives' MM23212D is the latest revision to its most popular line. This SCR, dual voltage (115 or 230VAC), reversing drive comes in a NEMA 1 enclosure. It is more resilient to vibration than its predecessor and comes with another new feature, a user-selectable inhibit circuit. Now the user can adjust the function of the inhibit with jumper pins. The MM23212D drive now comes with LEDs to let the user know when the power is on (green) or if the motor has reached the current limit (red). For applications that require control of a DC motor in the 1/20 to 1/4 HP range, the MM23212D is an excellent solution.